1.0.1 What is Papa Murphys? 2 Papa Murphys Pizza Coupons. Browse all the latest Papa Murphys Coupons, deals and specials, plus learn about the Papa Murphys Menu changes here. The Papa Murphys pizza restaurant chain routinely offers specials, deals and printable coupons to entice new customers to visit the restaurant. The pizza restaurant market is very competitive and the national restaurant chains are all keen to expand. The coupon system is much-used by the pizza restaurant chains as a marketing tool, and by the customers, as a way to save money. We will add the latest printable Papa Murphys coupons and promotional coupon codes in the comment section, for you to browse for free. Please note that some coupon codes may already have expired by the time you read this, but newer codes will be added as the year rolls by. Papa Murphy’s is a take-and-bake pizza company. Unlike regular pizza restaurants, the pizza is made at the Papa Murphys store but is not baked there. The customers bake the pizzas at their own homes. Take-and-bake pizzerias therefore typically have lower costs and they are often able to undercut the national pizza giants. There are currently over 1,250 stores in 37 states plus Canada. The Papa Murphys history started back in 1981, with the Papa Aldo’s Pizza chain in Oregon. The Murphy’s Pizza chain name then began in Petaluma, California 3 years later. Both were bought and merged by Terry Collins. In 2010, the chain was sold to Lee Equity Partners of New York. The company operates by taking orders from both walk-in and call-in customers (and also online orders soon). Some stores also have a drive-thru window. Papa Murphy’s specialize in pizzas but also offers salads, cheesy bread, cinnamon wheels, soft drinks and in some stores, lasagnas, as well. New Papa Murphy coupons will be added in the comment section. Keep checking back. Lately, Papa Murphys has been sending out email coupons more actively. See the comment section for the latest. Papa Murphy’s has emailed a $3 off coupon good for a Family Size pizza, for email subscribers. Its good through Saturday February 27, 2016. As the email says: Limit 3 per visit. This email is your coupon. Show this email in-store to redeem (directly on your mobile device or printed). Excludes FAVES and Dessert Pizzas. For Fresh Pan the coupon is valid for Large pizzas only. Papa Murphys Coupons 2016. Get $6 off two pizzas with a Papa Murphy’s coupon. Valid through Thursday, February 11, 2016. Offer expires February 11, 2016. Show this offer in-store (on your mobile device or printed) to redeem. Details: Off Any Two Family Size Pizzas at Regular Menu Price. 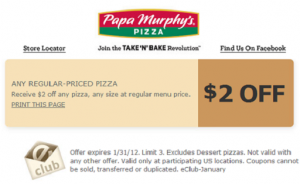 Papa Murphy’s Printable Coupon: Get $3 Off a Family Size Pizza, $2 Off a Large Pizza, or $1 Off a Medium Pizza. The coupon expires December 24, 2015. Papa Murphy’s has a coupon for free Cookie Dough with any pizza purchase, This coupon is good through Thursday, December 24, 2015. Show the coupon on your mobile phone or print and show to your server.